Layers of creamy potatoes and sweet winter squash, swimming in béchamel sauce, spiked with Gruyere cheese and toasted breadcrumbs, baked until golden brown– is the ultimate in comfort food. There is something special about breaking into a bubbling hot gratin that will not only steal the show at the dinner table, but will instantly become a family favorite. It’s rich and decadent enough to serve as a main dish with a side of mixed greens, and if there is any leftover the following morning, it is absolutely divine underneath a poached egg for breakfast. The mildly nutty flavor of winter squash is a lovely compliment to the potatoes in this dish. I used Lunga Di Napoli, an Italian heirloom variety that I discovered at my local farmers’ market. Lunga Di Napoli means, ‘Long of Naples.’ It’s in the same family as butternut squash, and has dark green skin with grey stripes that reminds me of a zucchini, but much bigger. 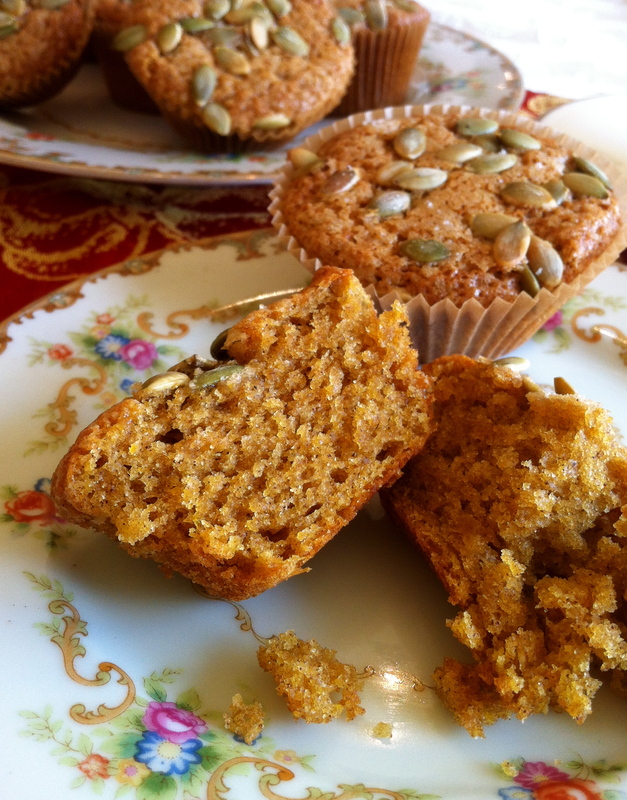 It has beautiful deep orange flesh that is melt-in-your-mouth sweet and delicious. Different types of winter squash such as delicata, acorn, or butternut would also be nice. Winter squash is a gold nugget of health benefits which makes eating them a nutritious choice, but the best part of all — is in the taste. 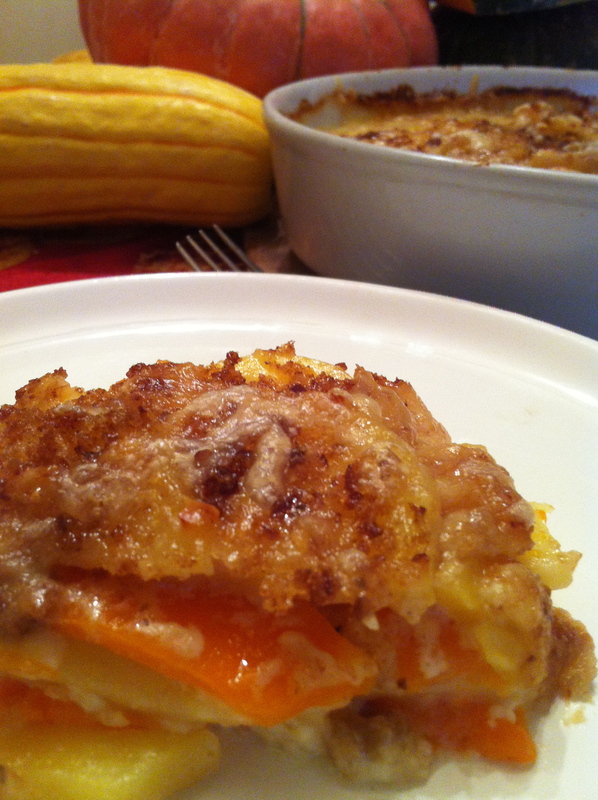 Read on for the Winter Squash and Potato Gratin recipe. Preheat the oven to 350°F. Butter a ceramic baking dish. Slice winter squash and potatoes about 1/8 inch thick. Layer potato slices in the bottom of the prepared ceramic dish. Cover with a layer of butternut squash slices and alternate with a layer of potato slices until the dish is full. Sprinkle with a few pinches of salt and freshly ground pepper. Pour béchamel, or cream if using, over the top and then sprinkle with Gruyere cheese. Cover with aluminum foil and place in the oven. Bake about 1 hour and 10 minutes, until vegetables are tender. Remove aluminum foil and cover the top with toasted breadcrumbs and sprinkle a handful of Gruyere cheese over the top. Bake 10 more minutes. Remove from oven and let it sit about 10 minutes before serving. For the infused-milk: In a small saucepan combine milk, onion, garlic, bay leaf, thyme, and heat until warm. Remove from heat and let it steep for 15 minutes. Remove onion, garlic, bay leaf, and thyme. In a medium-sized saucepan, melt butter over medium heat. Slowly add the flour, stirring constantly with a wooden spoon until smooth. Increase the heat to medium-high and slowly whisk in the infused milk, whisking constantly until thickened. It will coat the back of a spoon. Season with salt and pepper.